Web oficial del Villarreal CF - The Yellow Cup 2014 kicks off! The footballers from Villarreal CF are also part of the #YellowCup2014. Villarreal's #YellowCup2014 has kicked off today! @EndekaSports manages this traditional football tournament that takes place during the Easter holidays in the Submarine's Sport City (Vila-real). The competition will have an attendance of around 15,000 people, with more than 100 teams competing in all age groups, from U12 to U18. The first stage of the tournament takes place today, while tomorrow will host the second stage and the finals on Sunday. 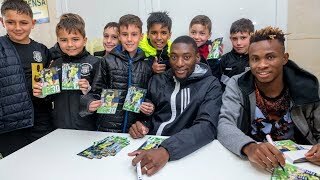 Nevertheless, the competition had a break today right after Villarreal's training session, so the players and the kids could take a picture together. A great memory for these kids! 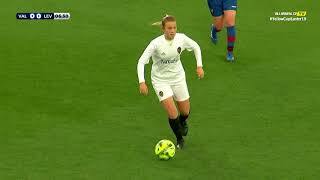 The competing teams come from all over Spain –Valencia, Atlético de Madrid or Levante, among others- and also different countries like Belgium, Indonesia, Qatar, Saudi Arabia, Venezuela or Argentina. They all get together in a great youth football party, share experiences and enjoy our sport. 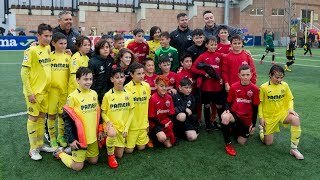 During the tournament there are a lot of activities scheduled: visits to El Madrigal stadium, welcome party, a tournament for parents and friends, among many other surprises. Calendars, teams and basic information is also attached to this news. Have a great #YellowCup2014!! !